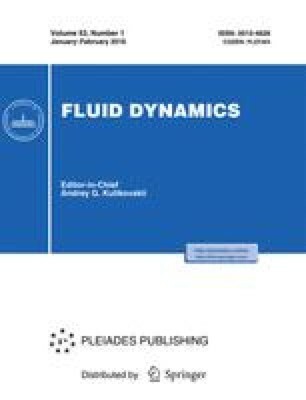 The problem investigated is the unsteady problem of the internal waves generated in a two-layer flow by a certain periodic perturbation which leads to small deviations from the basic flow. A method of constructing an approximate solution uniformly valid throughout the region of variation of the variables and the parameters of the problem is indicated. It is confirmed that for large times and near-resonance parameters the motion of the fluid is described by the mixed problem for a cubic Schrödinger equation. Certain qualitative properties of the solution of this nonlinear problem are noted. Translated from Izvestiya Akademii Nauk SSSR, Mekhanika Zhidkosti i Gaza, No. 6, pp. 82–90, November–December, 1987. The author is grateful to V. I. Bukreev and to I. V. Sturova for their interest in his work.